Can't do feature friday this week because Arnold suggested a great fun friday for tomorrow. So we will do feature thursday instead. That is just the first two videos of the "what to watch" feed but you can scroll forever and the recommendations are awesome. After Matt Cohler and Mark Zuckerberg, I got the top 10 Knicks plays of the 2012-2013 season, an Arctic Monkeys video, and a video about a 3D printed prefab house. This is like the #discover tab on Twitter but for video. 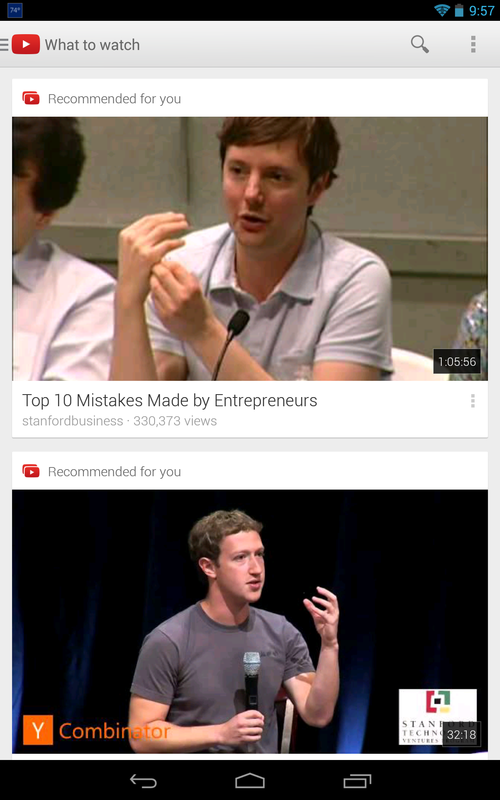 It's awesome and I've added the YouTube app on my Nexus7 to my daily content consumption flow now. I don't watch every video, but I watch a bunch of them. I think this is a killer feature. Strangely enough I don't get the same recommendations when I visit YouTube on the web. I get recommendations but they aren't as good. I wonder if they've rolled out something new on mobile first and will bring it to the web shortly. I spent some time a few months ago setting up some subscriptions in YouTube and that is certainly a big reason for why the recommendations for me are so good. I would recommend doing that as well. In any case, if you haven't checked out the new YouTube app and the "what to watch" feature, I strongly suggest giving it a whirl.